Details at the end of this post on how to win an ebook copy of this book and links to purchase it. 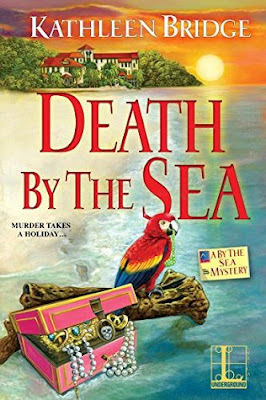 I am a big fan of Kathleen Bridge’s three-book Hamptons Home & Garden series, so I was very eager to read the first book in her new series, By the Sea Mystery. Her first book, Death by the Sea, takes us to the beach community of Melbourne, Florida, and introduces Elizabeth ‘Liz’ Holt who has returned home after a decade in New York that ended in a tabloid scandal. She accepted the role as assistant in her father’s law firm and her Great Aunt Amelia at the family-owned Indialantic By the Sea Hotel. Liz is also an award-winning author, but these new responsibilities offer a bit of an excuse to put her writing on hold...her “writing mojo” has been a bit stalled. Her idea to have a Spring Fling by the Sea to increase business for the shops housed in the Emporium has reenergized the hotel staff, business owners, the community, and guests…but murder? Kathleen Bridge continued with the same delightful writing style with descriptive and clever narrative and dialogue that made me a fan of her work. She engaged my interest bringing to life the oceanfront community, hotel environment, and several of the characters with whom Liz Holt works and resides while setting up some intriguing storylines. Liz is settling in at her family-owned hotel assisting her great Aunt Amelia with the Spring Fling by the Sea that has everyone in high gear. However, there are a few “monkey wrenches” that could derail the event’s success. Wrench One: The hoity-toity Regina Harrington-Worth, a temporary resident of the hotel, is complaining and demanding with rumors swirling about the circumstances surrounding her father’s recent death and her intention to tear down the historic Castlemara, her family estate, makes her a big “thorn” in everyone’s side. Wrench Two: Brittany Poole, owns Sirens By the Sea shop, but her abrasive, inflated, and “I'll pay you later” attitude makes her everyone’s least favorite member of the Emporium. Wrench Three: “Where is Iris?” Her tardiness or just plain MIA from her duties makes Liz pick up the slack. Wrench Four: Ryan Stone, grandson to Pops who owns the Deli-casies by the Sea, is handsome, yet unfriendly, arriving to help out his injured grandfather. 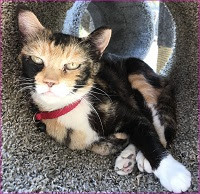 Wrench Five: A very odd cat…Venus? An obnoxious parrot…Barnacle Bob? So which ‘wrench’ will just be annoying, and which will lead to murder. Karma definitely had a few good targets to choose from, but you’ll need to wait patiently. The descriptions and introductions to the environment and all of the characters, however intriguing, seem to be the main focus for an extended amount of time, more than I personally prefer in my cozy mysteries. I enjoyed the informative references to treasure hunting, chicory coffee, and the area’s history along with 60s television programs and commercials with which I grew up, but the crime and the subsequent investigation by the amateurs and professionals took awhile to get going. Kathleen Bridge did created a rich set of characters and an engaging subplot dealing with Liz Holt’s scars, emotional and physical, which are key to how she reacts and deals with her insecurities and efforts to show her strengths. The rich supporting characters which include her father, her quirky aunt, friends, BFFs, and a possible romantic interest provide the right touch of conflict and humor. I eagerly recommend this book. It is very entertaining and a great way to start off the series. Mix with Murder and Bake! It is always exciting to see a cozy with my two favorite words. No, not Murderous Fun, although that's always good to see. No…Recipes Included! It's even more exciting when the recipes aren't random, but make for a complete meal or are actually connected to the theme or characters in the story. In Kathleen Bridge’s “Death by the Sea” she has included four marvelous recipes perfect beginning to end for a Girls’ Night In, book club gathering, or first date where you want to put your best foot forward. From Pops’ Deli-casies By the Sea we start with Pops’ Kalamata Hummus, next savor an entree of Baked Grouper Bites with Banana Salsa and a side of Coconut Rice, then enjoy from Chef Pierre’s Kitchen his Coconut Lime Sugar Cookies. Yum! Death by the Sea: earns 4.5/5 Karma Bites…Entertainment by the Sea! Book 2, A Killing by the Sea, is set to be released in September 2018! Leaving the Big Apple behind her, Liz Holt has found the perfect way to reenergized her writing, reconnect with her family and friends, and open her heart to a bit romance. Back at her family’s quirky hotel rich with friends and loads of guests, everyone is looking forward to the first annual Pirates’ Weekend. But, a body, a member of a fishing crew, washes up on the beach. Accident? Murder? Time is running out to find a killer since a hurricane is about to make landfall. E-X-C-I-T-I-N-G! Like, Visited, and Follow…Oh my! Contact Kathleen Bridge for email alerts & updates. To enter to win an ebook copy of Death By the Sea, simply email KRL at krlcontests@gmail[dot]com by replacing the [dot] with a period, and with the subject line “sea,” or comment on this article. A winner will be chosen April 21, 2018. U.S. residents only. NOTE: THIS GIVEAWAY IS THROUGH NETGALLEY-if you win you will need to join NetGalley-details will be given on how to do so. If entering via comment please be sure to include your email address. This book looks really good. I would love to read it! Thanks for the chance at the giveaway! This book looks really interesting. Thanks for the review and the chance at the giveaway. "Death by the Sea" sounds like a great start to a new series. Looking forward to reading. I love first of the series books and I am glad Authors are doing ebooks as giveaways too...sounds like a good mystery.